These 3 Dividend Stocks Are Absurdly Cheap, but Are They Buys? 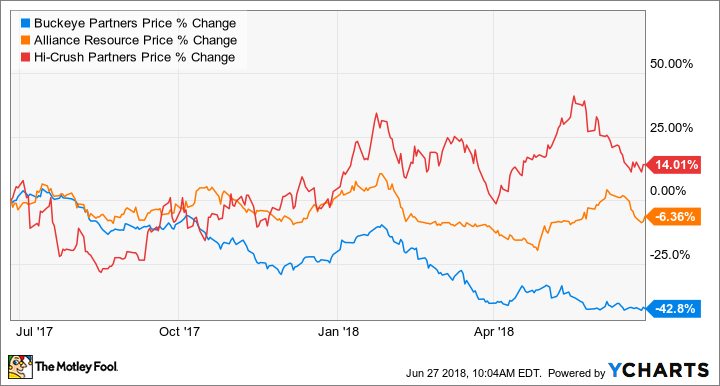 It's tempting to buy shares of Buckeye Partners, Alliance Resource Partners, or Hi-Crush Partners because of their high yields, but only one may actually be worth it. Dividend investors are considered conservative folk. They eschew hypergrowth stocks because of their speculative nature, and instead focus on the security of a regular check that can be used for income or to harness the power of reinvested dividends. At least that is what dividend investors want you to believe. In reality, they also have a speculative tendency in them; it's just that they indulge that tendency in the form of high-yield stocks trading for incredibly low valuations. Make no mistake, there is no such thing as a double-digit dividend yield that doesn't come with a healthy dose of speculation. Three dividend companies -- oil and gas logistics company Buckeye Partners (NYSE:BPL), coal miner Alliance Resource Partners (NASDAQ:ARLP), and fracking sand supplier Hi-Crush Partners (NYSE:HCLP) -- are all selling at gobsmackingly cheap prices, which likely has a few yield-chasing investors taking a look at them. But are any of these stocks actually worth buying today? Buckeye Partners has been one of the more reliable investments in oil and gas transportation and logistics ever since it went public back in 1986. A steady stream of distribution increases over the past 20 years has generated spectacular returns for investors over the long haul. Recently, though, the company has struggled mightily since oil prices started to crash a few years ago, dropping more than 53% over the past three years to the point that shares today have an eye-popping distribution yield of 14.2%. That is the highest yield this company's stock has had in its entire history as a public company. One of the reasons that Buckeye's stock has suffered so much lately is because the company is headed into choppy waters. Buckeye recently made a game-changing acquisition by purchasing a 50% stake in international crude-oil transportation and storage company VTTI for $1.5 billion. At the same time, though, it is taking on some ambitious projects that include an export terminal in Corpus Christi, Texas. Typically, when a company makes big moves like this, it does so from a position of firm financial standing, but that doesn't look like the case here. Buckeye's distribution coverage ratio (the amount of available cash generated by operations divided by the amount paid out as distributions) is less than one, which means it isn't covering its current payout. Also, with a debt to EBITDA ratio of 4.8 times, the company is approaching a level where creditors are going to start questioning Buckeye's investment-grade credit rating. This means the funds with which it can pay for growth are getting hard to come by. Management has already tapped some more-unconventional sources of funds such as hybrid debt (financing that straddles the fence between debt and equity) and using payment-in-kind equity (units that receive distributions in the form of more units instead of cash). Such moves don't mean that something like insolvency is imminent. But creative financial deals like these tend to be the forebears of more drastic moves such as asset sales and distribution cuts to shore up the balance sheet. Perhaps the company will be able to grow its way out of this issue. Buckeye has done it before, but until we see a material gain in cash flow and improving financial metrics, it's hard to justify buying this stock. Alliance Resource Partners has undoubtedly been the best-run company in the coal business this decade. It has stuck to its knitting by investing in low-cost mining in the Illinois Basin. It has also maintained strict financial discipline, which kept it from succumbing to bankruptcy like so many of its peers over the past three years. And management had the foresight to cut its payout to investors before things got bad to ensure that it had enough cash on hand to get through a brutal commodity price environment. The company has consistently churned out reliable earnings, and has generated ample amounts of cash to cover its generous payout. But the stock continues to languish and has a P/E ratio of 5.8 and a staggering distribution yield of 11.3%. If Alliance were in any other business, it would look like a screaming buy. Unfortunately, it isn't in any other business. It's in coal, and the longer-term trends for coal consumption just don't work in Alliance's (or any coal company's) favor. Even though the U.S. Energy Information Administration sees coal demand remaining relatively steady over the next 25 years, those projections don't seem to jibe with the rate at which coal-fired power plants are being retired and the age of the current plants. The average coal plant in the U.S. is 39 years old and likely reaching the twilight of its economic life. Furthermore, there aren't a lot of utility companies looking to build new coal facilities. There's a good chance that Alliance will be able to at least maintain current operations for some time as it captures market share from other coal companies, but the gradual decline of coal consumption is going to put pressure on prices. I wouldn't be surprised if an investor could reap some decent returns with that high yield over the next couple of years. But as a long-term investment, it's hard to make a compelling case for Alliance right now. One of the most volatile industries over the past few years has been frack sand. When shale oil and gas were on the rise in the first half of this decade, investors were clamoring to get into these stocks, only to run for the exits once oil prices started to crash from 2014-2016. And Hi-Crush Partners didn't exactly help its cause at the time. The company spent a lot of money expanding operations and put itself into a financial hole, which led to a suspension of its distribution and the issuance of a boatload of stock to shore up the balance sheet. A lot has happened since then, though. Oil and gas producers found that using a lot more sand per well improves well economics, so frack sand demand is higher than it ever has been even though the number of active rigs is way down from its peak. This has allowed Hi-Crush to repair some of that financial damage and grow the business with new mines in the increasingly important Permian Basin region. With a new mine there up and running as well as consistent performance from its last-mile logistics services, management has felt confident enough to reinstate a distribution -- currently yielding 7.6% -- as well as buy back some stock to offset previous issuances. There is fear, of course, that the company could experience another downturn. While that is possible, shale oil and gas as an industry look to be on much better footing than a few years ago. Breakeven prices for most shale producers are around $50 a barrel, and management teams are more focused on returns than production volumes. Additionally, Hi-Crush has mostly completed its growth phase, and its balance sheet is in relatively good shape, so it appears much better positioned to handle another downturn should one come. Investors are still treating shares of Hi-Crush with kid gloves because of prior problems, but those willing to see the company for what it is today will find a potentially great high-yield investment.